`Why can't you just get along?' This is a question children are commonly asked. But they will usually have a very `good' reason for their conflict - `Because he's always telling me what to do! '; `She stole my lunch!'. The fact is that any in social situation there is a potential for conflict. 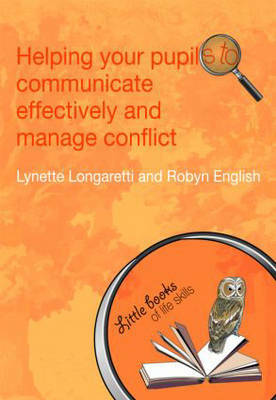 What children need are the skills to manage conflict when it does arise. Helping your pupils to communicate effectively and manage conflict looks as the basics of effective communication and the essential skills for forming and sustaining productive relationships. Focusing on promoting a culture of fairness, respect, inclusiveness and cooperation in the classroom, this book shows teachers how they can help their pupils understand things from another's point of view and foster empathy, by learning specific skills (such as describing behaviours, checking one's perceptions, summarising ideas and feelings and giving and receiving feedback) and practicing specific activities (such as role play, structured controversy, problem-solving, simulation, discussion and reflection). This book suggests ways to organise the classroom, provides teaching strategies and pupil activities and gives notes on assessment and record-keeping. It is complemented by several pages of proformas, which can be copied or amended for use in the classroom.